If you are a newly qualified pharmacist and are considering your options, the idea of becoming a locum is a consideration. One question that is often asked is about locum pharmacist tax and the way in which a locum pharmacist interacts with HMRC in relation to their work. 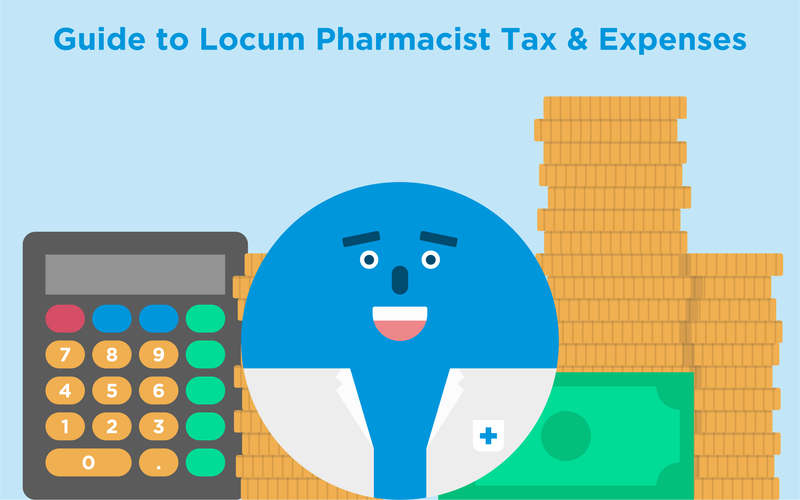 This guide will answer the questions you might have and also explain what locum pharmacist tax expenses are available to claim. How Do Locum Pharmacists Pay Tax? A locum pharmacist works in a self-employed capacity on a temporary basis. Normally a contract will be made between the pharmacy and the locum which will outline the expectations within the role and what will be expected from the locum pharmacist. It will also outline the fact that a locum is considered self-employed and as such, HMRC requires the individual to file their own taxes annually. This means that whatever the locum pharmacist agrees to be paid for their services, they must deduct taxes from that amount themselves, and ensure that it is submitted to HMRC in a timely manner. This will also be true for the payment of national insurance (NI), which will be a requirement in any locum pharmacist tax calculation. Travel expenses including the cost of upkeep for a vehicle to take you back and forth to work inclusive of petrol costs and insurance (to the portion that it is being used for work purposes), the cost of parking, cleaning the vehicle and anything else that is necessary to be able to drive to work. If you do not have a vehicle, the cost of the bus or train will be expensed with a receipt. A home office for administrative purposes and the equipment needed to keep track of invoices and send invoices, including a computer and printer. Professional subscriptions such as pre-registration fees, and membership of professional bodies – such as the Pharmacists’ Defence Association, the General Pharmaceutical Council and the Royal Pharmaceutical Society – can be claimed back. Personal indemnity insurance payments which are a requirement to hold under most agreements between pharmacies and locum pharmacists can also be tax deducted as a necessary expense. In general, any other payment that must be made in order to meet the expectations of the job, including but not limited to a professional clothing allowance. It is best to have a review by a certified accountant when you file for your first year of taxes as a locum pharmacist in order to ensure that what you are claiming for is allowed and maximised within HMRC allowances. After that it would be possible to follow the example that the accountant created and file your own locum pharmacist tax annually. You will be required to keep up with NI payments, which is another reason to seek out advice in the early stages of your locum pharmacy career. Overall it is a pretty simple requirement of filing tax and maximising expense deductions but always remember to save the receipts for every allowance that you claim. You may or may not need them in the future.